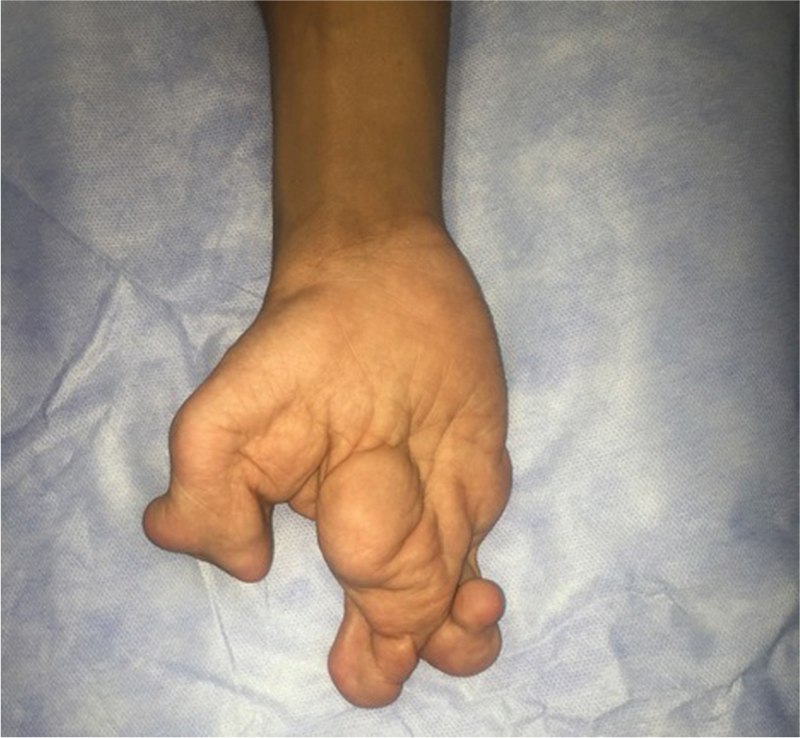 Cenani–Lenz syndrome is a rare autosomal recessive congenital malformation syndrome characterized by syndactyly and oligodactyly of fingers and toes, disorganization and fusion of metacarpals, metatarsals, and phalanges, radioulnar synostosis, and mesomelic shortness of the upper limbs, with lower limbs usually being less severely affected and associated with facial dysmorphism and renal abnormality. 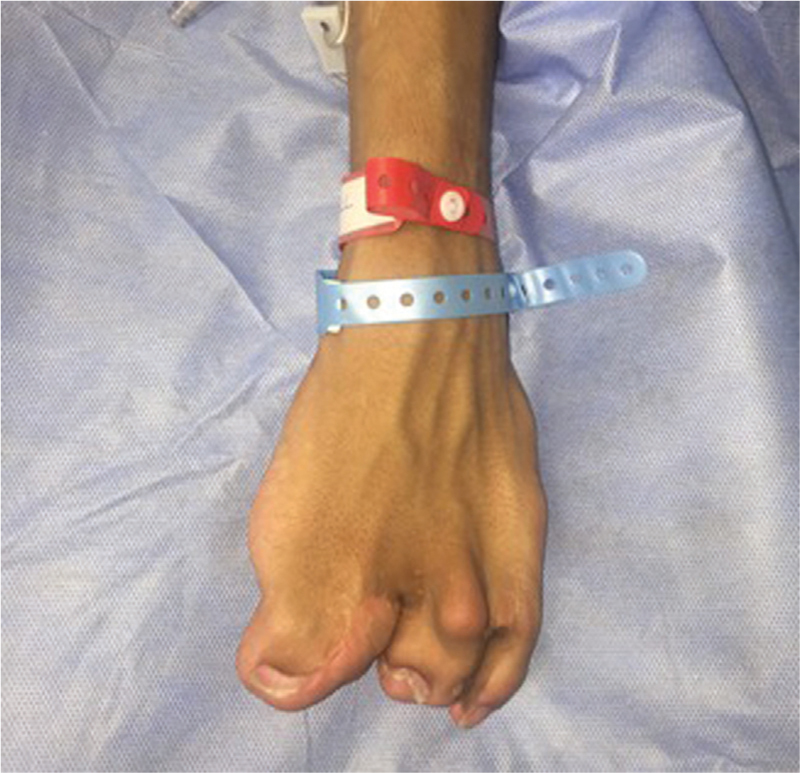 A case report of a 16-year-old Saudi male presented with four limbs syndactyly of fingers and toes, mild facial dysmorphism, dextroscoliosis, and crossed fused ectopia of the left kidney at the right side is presented here. Cenani–Lenz syndrome (CLS, OMIM212780) is a rare autosomal recessive congenital malformation syndrome characterized by syndactyly and oligodactyly of fingers and toes, disorganization and fusion of metacarpals, metatarsals, and phalanges, radioulnar synostosis, and mesomelic shortness of the upper limbs, with lower limbs usually being less severely affected. Facial dysmorphism and renal abnormality associated with CLS., It is a rare condition, and the exact incidence and prevalence have not been evaluated. In 2010, this condition was found to be caused by mutations in LRP4 gene on chromosome 11p12-p11.2, a member of the low-density lipoprotein family of receptors. LRP4 has been shown to antagonize LRP5/LRP6 activation of Wnt and β-catenin signaling. Loss of LRP4 function leads to excessive Wnt and β-catenin signaling in the limb bud, which causes abnormal limb development., However, failure to identify LRP4 mutations in two of the well-phenotyped 14 families used to map the disease locus, indicating genetic heterogeneity of CLS. The 16-year-old boy has consanguineous parents with family history of CLS in three of his cousins. He was born at term following an uncomplicated pregnancy. Both delivery and neonatal course were unremarkable. He had a history of septal heart defect which was managed conservatively and a history of right hip dislocation, treated at childhood. He had four limbs syndactyly of fingers and toes [Figure 1],[Figure 2][Figure 3][Figure 4][Figure 5]. In the left hand, there is complete soft tissue syndactyly of the first and second digits and third and fourth digits. In the right hand, soft tissue syndactyly is involving the second, third, and fourth digits with shallow cleft between the third and the fourth digits. Foot examination revealed soft tissue syndactyly of the left third and fourth toes and soft tissue syndactyly of the right second and third toes with mild hind foot valgus deformity. In addition, he had dextroscoliosis [Figure 6] and pseudotail of the coccyx at the back, and mild facial dysmorphism included broad forehead, depressed nasal bridge, and prominent upper incisors [[Figure 7] and [Figure 8]]. Height and development were normal. Skin and neurological examination were within normal. The remainder of the physical examination was unremarkable, and he was otherwise healthy and active. Genetic testing showed splicing mutation in Adenomatous Polyposis coli (APC) gene. 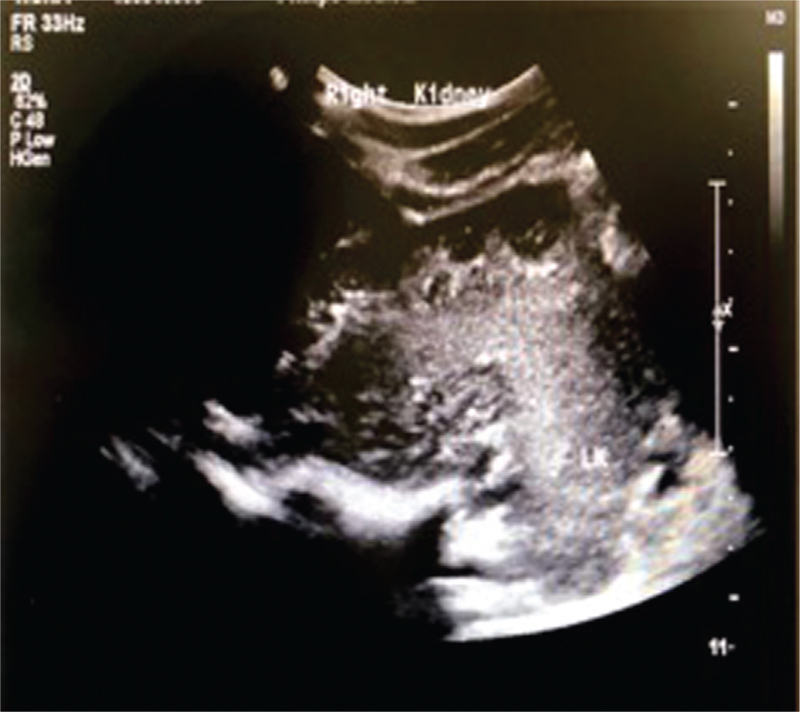 Renal ultrasound revealed crossed-fused ectopia of the left kidney at the right side [[Figure 9] and [Figure 10]]. Both abdominal ultrasound of other organs and echocardiogram were unremarkable. The complete blood count, thyroid function tests, liver enzymes, coagulation profile, urea, and electrolytes were all within normal limits. Radiologically, there is complete fusion of the C2 and C3 vertebral bodies and partial posterior fusion of the C4 and C5 vertebral bodies. Spina bifida of T1, T2, and T3 vertebrae was noted. 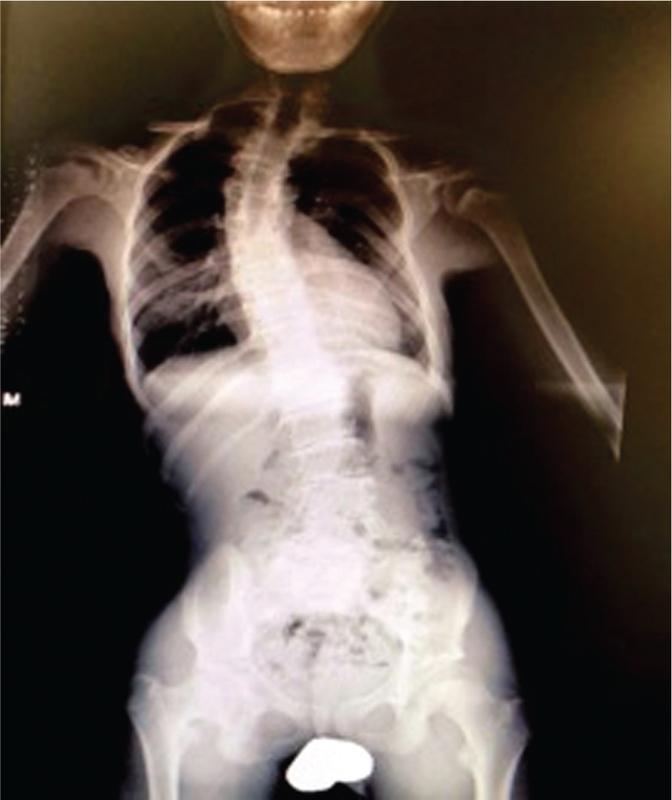 Dextroscoliosis of the thoracic spine was seen. Multiple abnormal ribs with wavy margin are noted bilaterally. The rudimentary ribs are noted on the left side at level of rib numbers 1, 4, and 7. There is thinning of posterior part of the multiple ribs, which is most marked in the left eighth rib. The left 12th rib is absent. The lung is clear with normal heart size. The visible part of both clavicles and scapulae are unremarkable [Figure 6]. The distal ends of both humeri appear dysmorphic with mildly laterally displaced capitellum. The radius and ulna appear normal bilaterally. In the left hand, there is complete soft tissue syndactyly of the first and second digits and third and fourth digits. All phalanges of the second digits and distal phalanx of the first digit are abnormal in size and shape with boney syndactyly at the level of distal phalanges. The middle and distal phalanges of the fourth digit are very small and dysmorphic. 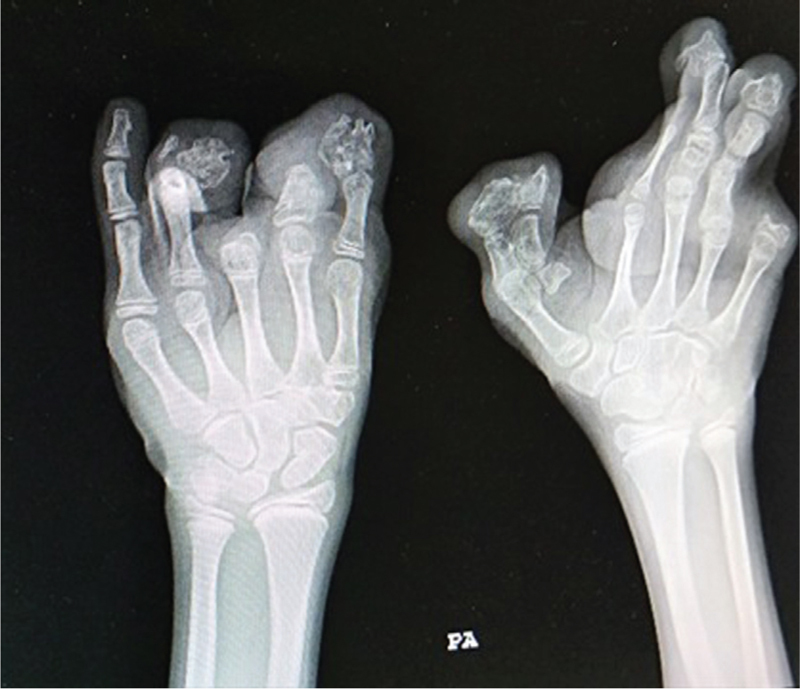 Only the epiphysis of the proximal phalanx of the third digit is visualized, and the rest of the proximal phalanx is absent. The middle phalanx of the third digit is grossly dysmorphic with expansion. The left fourth metacarpal is slightly smaller in size. In the right hand, duplication of the thumb is noted. The extra digit consists of dysmorphic phalanges and a very small metacarpal with no intervening soft tissue cleft. The phalanges of the complete thumb are also dysmorphic. Soft tissue syndactyly is noted involving the second, third, and fourth digits of the right hand with shallow cleft between the third and the fourth digits. The second metacarpal and proximal phalanx of the second digit are very thin with absent middle and distal phalanges. The proximal phalanx of the third digit is dysmorphic with expansion. The distal phalanges of the third and fourth digits are dysmorphic showing irregular shape with expansion. Only the epiphysis of the proximal phalanx of the fifth digit is visualized, and the rest of the phalanges are absent. There is horizontal orientation of the sacrum with the reversal of its normal curvature. The appearance of the right iliac fossa bone is probably due to patient’s rotation. Both hip joints appear normal, and mild right coxa vara is noted. Distally, the long bones of both lower limbs appear normal. Mild hind foot valgus deformity is noted. Soft tissue syndactyly of the left third and fourth toes is noted. In the right foot, soft tissue syndactyly of the second and third toes is noted with an incomplete extra digit consisting of proximal and middle phalanges, possibly due to bony fusion of the middle and distal phalanges of the second and third toes and extra digit. 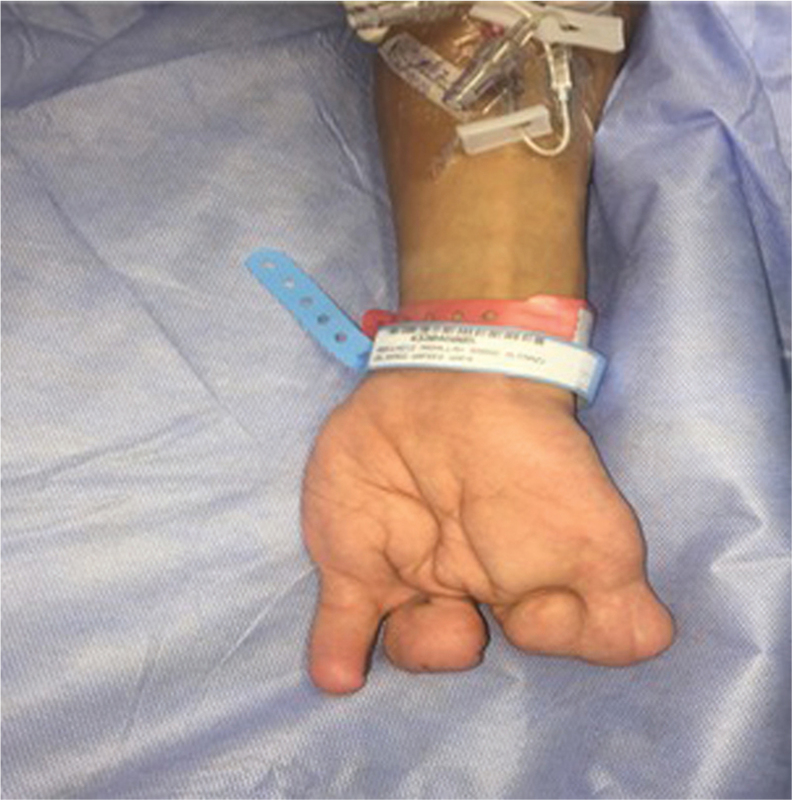 The patient underwent release of syndactyly of both hands with unremarkable recovery. Besides release of syndactyly, the patient underwent coccygectomy and orthopedic aid application by orthopedic department. He was referred to nephrology for management and surveillance of kidney function. Although the etiology remains obscure, however, there are several reports that might explain the etiology of the disease. Mutations in LRP4 gene on chromosome 11p12-p11.2, a member of the low-density lipoprotein family of receptors initially, was found to be the cause of CLS. LRP4 has been shown to antagonize LRP5/LRP6 activation of Wnt and β-catenin signaling. Loss of LRP4 function leads to excessive Wnt and β-catenin signaling in the limb bud, which causes abnormal limb development., However, failure to identify LRP4 mutations in two of the well-phenotyped 14 families used to map the disease locus indicates genetic heterogeneity of CLS. Other reports revealed the presence of a novel splicing mutation in APC with CLS that results in ∼80% reduction of the wild-type transcript and the creation of an aberrant transcript that predicts a severely truncated APC. This was associated with upregulation of Wnt/β-catenin signaling. Clinically, CLS has a variable clinical presentation (complete/incomplete syndactyly, oligodactyly, presence or absence of forearm, lower limb manifestations, facial dysmorphism, or renal anomalies). The various clinical features may be a result of genetic heterogenicity. Harpf et al. subdivided the cases into two phenotypes: the classical or spoon-hand type and the oligodactyly type. Quality of life depends on severity of limb anomalies, and majority of patients live an independent life. Life expectancy is normal in these patients. Cenani A, Lenz W. Total syndactyly and total radioulnar synostosis. Z Kinderheilkd 1967;101:181-90. 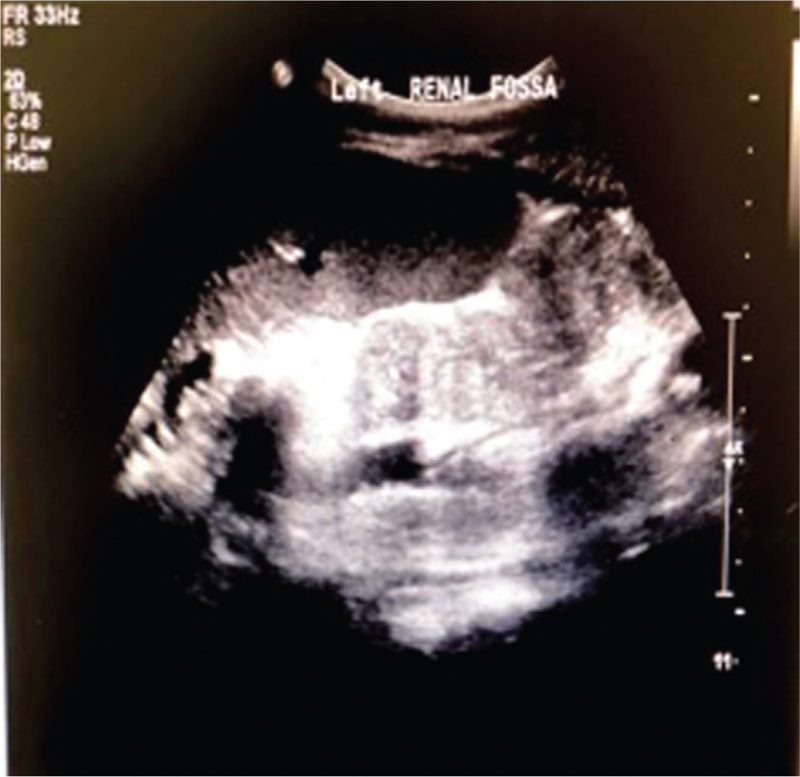 Genet C. Cenani-Lenz syndrome with renal hypoplasia is not linked to FORMIN or GREMLIN. Clin Genet 2001;59:203-5. 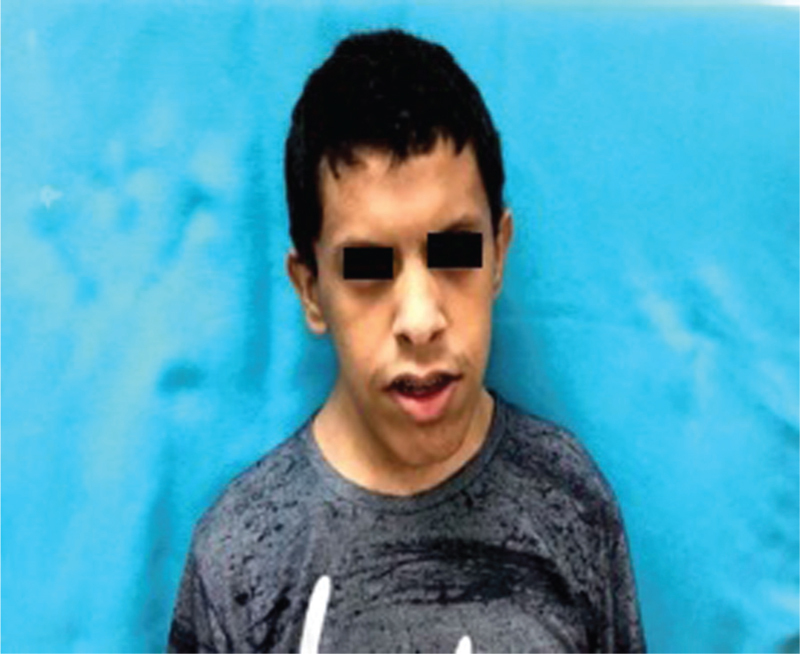 Jarbhou H, Hamamy H, Al-hadidy A, Ajlouni K. Cenani-Lenz syndactyly with facial dysmorphism, hypothyroidism, and renal hypoplasia: A case report. Clin Dysmorphol 2008;17:269-70. Kariminejad A, Stollfuß B, Li Y, Bögershausen N, Boss K, Hennekam RCM et al. Severe Cenani-Lenz syndrome caused by loss of LRP4 function. Am J Med Genet A 2013;161:1475-9. 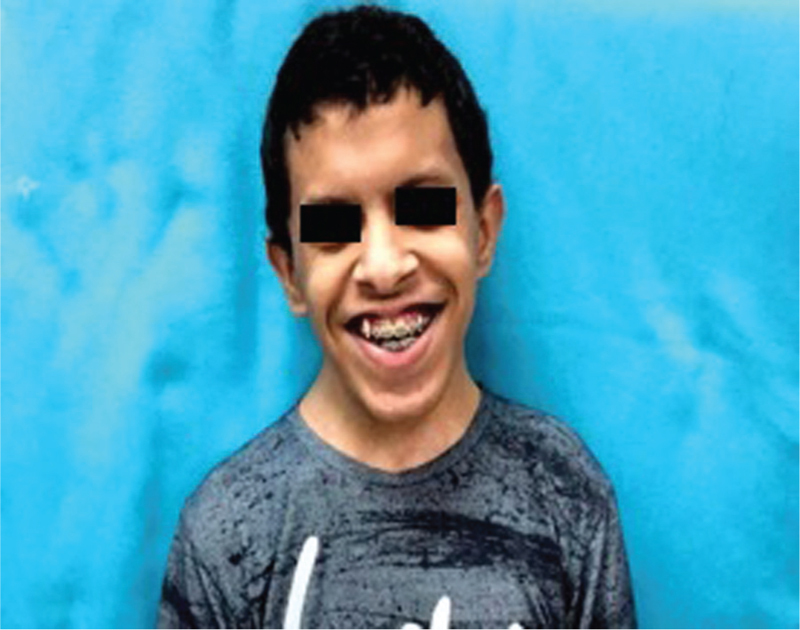 Nezarati MM, McLeod DR. Cenani-Lenz syndrome: Report of a new case and review of the literature. Clin Dysmorphol 2002;11:215-8. 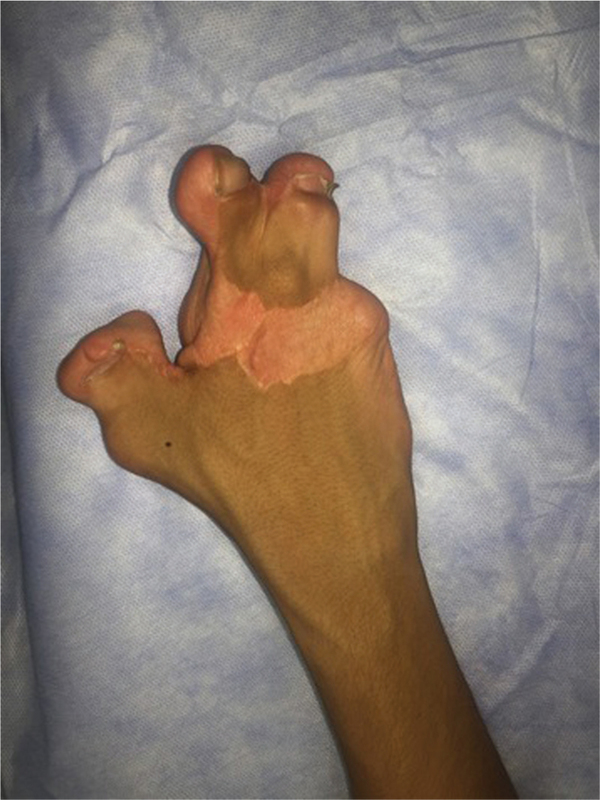 Harpf C, Pavelka M, Hussl H. A variant of Cenani-Lenz syndactyly (CLS): Review of the literature and attempt of classification. Br J Plast Surg 2005;58:251-7. Li Y, Pawlik B, Elcioglu N, Aglan M, Kayserili H, Yigit G et al. LRP4 mutations alter Wnt/β-catenin signaling and cause limb and kidney malformations in Cenani-Lenz syndrome. Am J Hum Genet 2010;86:696-706. Drögemüller C, Leeb T, Harlizius B, Tammen I, Distl O, Höltershinken M et al. Congenital syndactyly in cattle: Four novel mutations in the low density lipoprotein receptor-related protein 4 gene (LRP4). BMC Genet 2007;8:1-12. Simon-Chazottes D, Tutois S, Kuehn M, Evans M, Bourgade F, Cook S et al. Mutations in the gene encoding the low-density lipoprotein receptor LRP4 cause abnormal limb development in the mouse. Genomics 2006;87:673-7. Patel N, Faqeih E, Anazi S, Alfawareh M, Wakil SM, Colak D et al. A novel APC mutation defines a second locus for Cenani–Lenz syndrome. J Med Genet 2015;52:317-21.